You Shall Go To The Ball. It’s one of the most Magical stories that has stood the test of time. 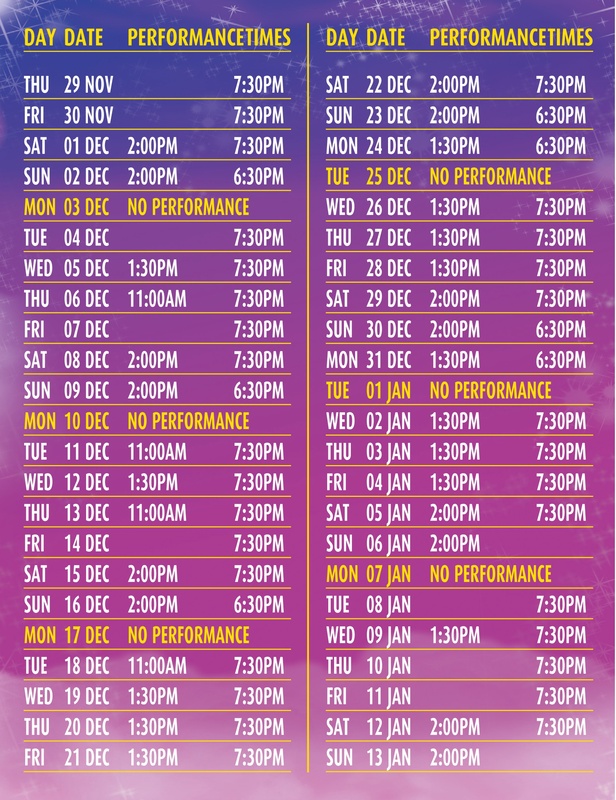 For generations there is one pantomime that everyone loves and it’s back at the Pavilion Theatre Glasgow. It’s the classic rags to riches fairy tale that enchants all ages. The Magical Adventures of Cinderella. Featuring as always in a Pavilion panto , Sing-a-long songs, plenty of Silliness , lots of laugh out loud comedy, traditional audience participation and our enchanting magical, costumes and scenery it’s guaranteed to make your panto experience unforgettable! My son and I enjoyed every minute of the show. Lots of laughs and good sing along. Modern enough for the kids but still a touch of good old fashioned Glasgow pantomime nostalgia we loved it and will be booking for this year for sure. Thoroughly enjoyed the pantomime at the pavilion we enjoy it so much that we travel over from Fife to see the panto for the last 4 years well worth a day out fabulous cast and kept well entertained we loved the glesga shark too. Both myself and two Grandchildren enjoyed the show it was excellent,a bit of everything thrown in to it jokes for adults that would just go over children’s head also plent for them .Wasnt sur my Grandaughter would sit through all of it as she’s only three,but boy was I wrong,she loved it.Lots of bubbles were blown over the place from above,great touch.Will be going back again this year,will not miss a panto as I took my children when they were wee and they always had a fabulous day. It was fabulous, superb cast and first panto I have been to for a good few years. Been to see this show twice and I’ve never done that!Absolutely brilliant from start to finish.Cast are great and all put so much into show.Set and costumes are fab.Everything a panto should be.Villian,ugly sisters,good guys all were amazing.Cant wait to see what this years will be.Well done The Pavilion.Brilliant,brilliant,brilliant!!! Was at the show 10th Jan for nephews birthday and laughed so much at the antics of actors. The cast was brilliant and scenery great, with snow and lazer lights. Well done to all cast, crew and staff for a really enjoyable night. 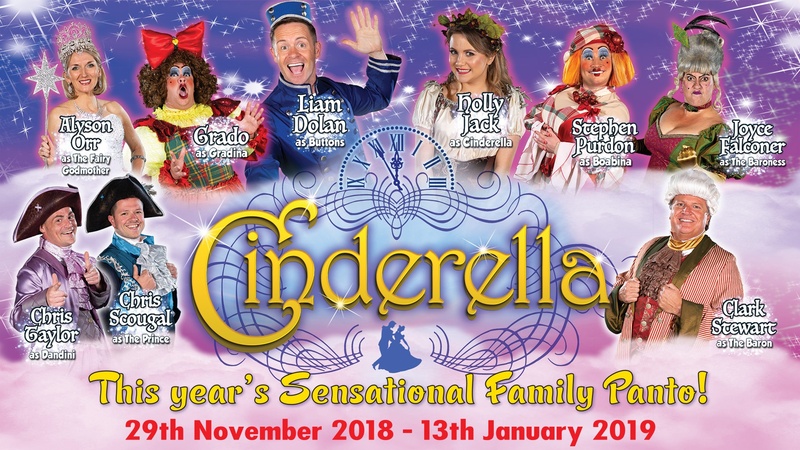 I went last night to see Cinderella with my friend it was amazing Liam Dolan has a big future in front of him he was great as Buttons so funny as was Stephen Purdon and Grado,whole cast were great from dancers to Cinderella and costumes were outstanding I go every year to Pavillion we have to support our local theatre here’s to next one. Not laughed so much in ages!!! Both my kids age 12 and 7 had a brilliant night. Buttons and the ugly sisters were amazing and hysterical. Highly recommend to everyone and if I get the chance I will be back with hubby to see it all again before the 30th. Thank you for a great night! Was there yesterday afternoon with my daughter and granddaughter. Had a great time, it was so funny. Thought the production and costumes were brilliant. The ugly sisters were brilliant. I am not usually a great panto lover but this has helped to change my mind. The cast were so hard working to ensure the audience enjoyed themselves. Hopefully will be back next year. Welll done everyone, take a bow !!! Thank you Pavillion for changing my tickets from 1st December until tonight. Had a great laugh with my son. All of the actors and dancers were terrific. A special thanks to “Dandini” for giving my son a high 5 in Renfield Street. If you’ve not been don’t hesitate. Buy your tickets now as it finishes on Sunday. Absolutely outstanding show. Laughed from start to finish . Costumes were fabulous and 5 star performances from all the cast . Brilliant. Would highly recommend. Absolutely loved it this year. The ugly sisters stole the show. Laughed non stop. Can’t wait till next year’s. Hilarious, literally crying with laughter! Thoroughly enjoyed it! Fantastic Panto, 1st class, we took 3 generations of our family today and everyone of us loved it….roll on next year, thank you . Laugh from start to finish great night out defo worth going to see. Outstanding show!!! Special mention to Buttons, the ugly sisters and the baroness. It looked liked you all had as much fun as we did. The gymnastics was a real surprise too. Fantastic pantomime…. always the best and this year no exception…. very funny!! Brilliant cast! Everything about it ticks every pan to box… from lighting , to music.. and the full cast, who are cast perfectly! Buttons actor just fab! Second time seeing this. Chris Taylor steals the show with his hilarious antics. He has such a lot of talent. We need to have him back in Ayr panto, we shouldn’t need to travel to see our local talent. There were 6 of us and everyone loved it. Great show, my wee 4 year old granddaughter is still talking about it and she still had us all acting it out!! Well done to all the cast. Brilliant, we have been going for the last four years, autistic grandson reckons it’s the best since Santa Claus is coming to town. Brilliant. Brilliant. Brilliant. The entire cast were so good very funny adults and children laughing and clapping from start to Finnish. The best pantomine I have seen in along time. My friends and I have never laughed so much in a long time. It was a tonic . The show and cast were AMAZING. So very funny. Pavilion staff could not have been more helpful. Welcome back to this wonderful theatre. Loved Cinderella this evening(Friday the 28th). A fun filled show from start to finish. I came through from Edinburgh with my adult son and we were both fully engaged from start to finish. Liam Dolan was brilliantly cast as buttons and obviously loved performing the part, I’d like half his energy. Joyce Falconer was a wonderful baddie. Her make-up was amazing too as it must be difficult to make a bonnie woman so hard and evil looking. I loved the Baron and although I must declare a vested interest because I have seen Clark Stewart perform many a time I was a little disappointed that we didn’t hear more of his lovely singing voice. What I did see and hear was fantastic but I wish his song hadn’t been cut however funny Gradina and Boabina were. I liked the show so much in fact that prior to writing this I just bought myself another ticket! My congratulations to all involved and thank you for fantastic entertainment. My partner and I took my 7 year old Grandaughter to see Cinderella on 27 December 18 evening performance. It was a fantastic show and I was amazed at the beautiful costumes and stage settings. We had a really good night laughing and joining in with the singing and dancing. We visit your pants every year but I think this was the best one yet. Freya told her mummy it was a fantastic show. Thank you again for making our night memorable. Well done to everyone at the Pavillion Theatre. We are just home from the panto and we had a fantastic time. I have seen 3 pantos this year and Thisbe was undoubtedly the best. We saw Cinderella in the armadillo and it was not a patch on the pavilion! Brilliant show! Brilliant pantomime. Very funny. Great laser lighting effects. Definitely worth a visit. Absolutely loved the panto this year. Fantastic cast. Great production and amazing costumed. Had a real belly laugh from start to finish. Loved the dancing and music. Also Holly Jack is just fabulous. A very well done to all of the cast and crew. Absolutely brilliant !! My granddaughters first panto, and she thoroughly enjoyed it, and so did I. Well done to all involved . Fantastic panto! What a laugh from start to finish, fun for a the family. Amazing. A phenomenal rendition of Cinders. An absolute must-see. Not what I expected from a panto at all. Excellent as usual. Scenery and special effects were of a very high standard. Cast were very talented and professional. So glad you were able to put the show on after the fire. Thank you to everyone at the Pavilion. Myself sister and my great niece come from Cumnock to the pavillion panto every year !! This years panti was one best I have ever seen !! Cast were amazing !!! What a great show . My grandchildren loved it, and so did my son and daughter and I . Laughs from start to finish. Hi, my husband and I travelled from Lauder in the Borders to see your Panto last week and enjoyed it very much. I thought the costumes and the headdresses worn by the Cinderella were brilliant, there was only one thing disappointing and that was when the Baron sang in the first half his voice was drowned out with the music as it was too loud then in the second half he started to sing again and he was cut off mid way through. We thought the Baron had an amazing voice and it would have been good to hear him sing a number straight through himself. Went yesterday with the Govan Reminiscence Group. I was on my feet joining in doing the Glasgow crocodile. A marvelous experience. singing p more as he had a very good voice. Great show. Chris Taylor is a fantastic actor and his facial expressions are hilarious. He plays Dandini perfectly. I enjoyed the panto and everyone was great. I’ll be back to see it again. Absolutely brilliant, 3 of us loved it from start to finish, it was so funny. Can’t believe it. I’ve just found my tickets for the show. We should have been there last Saturday at 730pm show! Cinderella for all ages at the Pavillion. Young, old, tall and small, all laughed and sang along with Buttons (Liam) and his panto family in this fab show. Laughter rang out through the theatre as one joke didn’t wait for the next. Fairly priced tickets mean all the family can see the show. Thanks Chloe for helping us out. 5star treatment. We were able to sit back and enjoy the show. Loved it! Hope to be back soon. Went to see the show on Saturday night best panto I’ve ever been to. Everyone was amazing but Buttons was my favourite and the aerial dancers left us gasping .Truly fantastic. Just been to see it it was brilliant as usual well done everyone we go every year . What a fantastic show grandchildren loved it, and so did we…well done everyone. Very good. Stephen purdon deserves everything he was fantastic, especially when she (he) was on the bed with her sister. Every one of them done fantastic!! Second year in a row, can’t wait till the third. Buttons and the ugly sisters made the night. Amazing show kids loved it ans so did I definately suitable for all ages. All characters were fantastic particularly Buttons and the step sisters . Loved the dancers too especially the aerial arts , it was magical and hilarious start to finish recommend to everyone. Great way to start off the festivities. Wow!!!! The costumes were truly amazing!!!! Helped make the magic for me and my family. Brilliant proper panto with bells on it. A great night for young and old alike. Great fun! Liam great as Buttons, Joyce the best bad baroness. it was the most fun time of my life Liam Dolan as buttons was the best with him cracking his fabulous jokes what a comedian he is I now have soar ribs laughing at him. What a fantastic night! First time at a panto in years and without kids….just me and my husband, both of us acting like big kids and having a brilliant evening. Thanks! We’ll be back. What a brilliant night me and my partner had tonight at cinders from start to finish both in our late 50ts so its a must for all ages . Well done to all cast and crew will definitely be back for next years PANTO . 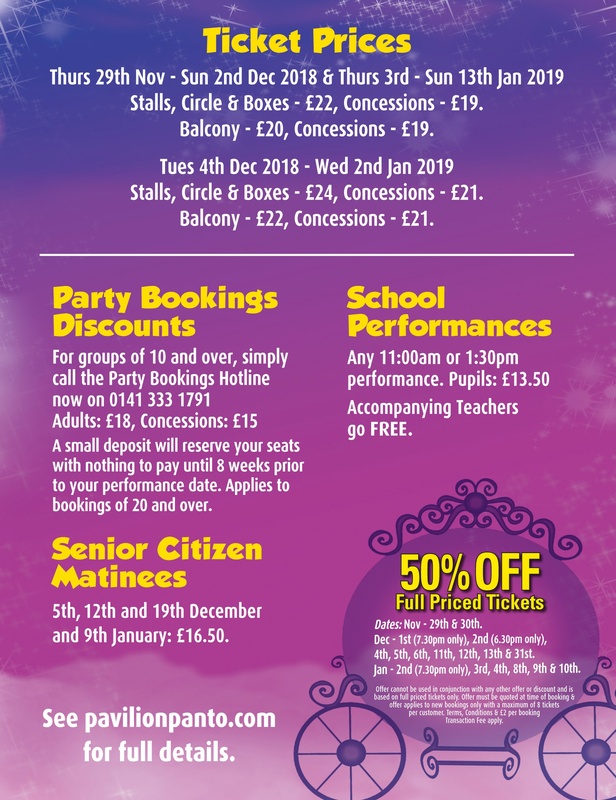 Cinderella is easily the Pavillion’s best panto ever, a must for Xmas , so glad I’m going again next week . i really look forward yo Christmas time especially Christmas pantomine every year at the pavilion theatre: last year Christmas pantomine 2017 at the pavilion theatre was really funny and hilliour’s to enjoy watching: fantastic and excellent AND i really am looking forward to this year Christmas pantomine Cinderella: i give all Christmas pantomine show’s a fantastic excellent performance of 10 out of 10 !